Because we know how hard it is to decide whether to go with one hosting company or another, here, at Versus Web Hosting, we strive to offer the most reliable information regarding web hosting companies. This article will compare two major league companies: Just Host and GoDaddy. Each has its own resources, power, and tech necessary for you to do online business or maintain your personal website in good conditions. The criteria for our Just Host vs GoDaddy comparison includes performance, prices and features, security, usability, and customer service. Most competent web hosting companies use global data centers to optimize performance. Getting technical, Just Host has an uptime guarantee of 99.90%, which can go as down as 99.39%. Which is bad. Their page load speed is 1,170ms, which is subpar, compared to other hosting providers. Turning to GoDaddy, we have seen that they have a page load speed time of 309ms as an average, while their uptime guarantee has been as consistent as 99.96% on average, while they can even reach 100%. As it can be seen, GoDaddy wins with ease in this category thanks to their superior page load speed and uptime guarantee. Both companies offer packages for shared and dedicated server hosting featuring increasing scalability. Discounts are offered for new service with regular prices applied upon renewal. Each requires full payment of services up front. Just Host offers a length of service from one to 36 months, while GoDaddy offers only yearly terms. It should be noted that a one month term at Just Host has additional fees associated with it. Just Host four web hosting offers for shared servers: Basic, Plus, Prime, and Pro. The Pro package has 80% fewer accounts per server. They only mention Linux servers on their website. They also offer three dedicated server hosting packages and four virtual private server (VPS) packages. The dedicated server and VPS packages are differentiated by scaled hardware platforms that range from dual to quad core CPUs that range from 2.2 to 3.3 GHz. GoDaddy offers three shared server offers: Economy, Deluxe, and Ultimate. GoDaddy offers a 2X power and memory enhancement option with their Ultimate package. Four dedicated server hosting packages and four VPS packages are also available. The dedicated and VPS packages have the same hardware platform, four CPU cores at 3.1 GHz, with the differences in the packages due to memory and storage. All packages are available for both Linux and Windows platforms. GoDaddy wins, it has more juice, and its pricing is lower than Just Host’s pricing. Both companies offer security monitoring 24 hours a day, 7 days a week. GoDaddy specifically mentions protection from DDoS attacks. Another aspect of security is the ongoing maintenance and upgrades to the hosting servers, which both companies offer, although it isn’t explicit. GoDaddy offers SiteLock and SSL certificates, but they are available only for certain types of hosting packages. Site backup is a paid option. Just Host offers the standard 24/7 network monitoring. If you opt for Just Host’s Pro plan, you get free SSL certificates and dedicated IP address. This is a tie because neither of the two companies offers accessible information regarding their security features for each individual hosting package. 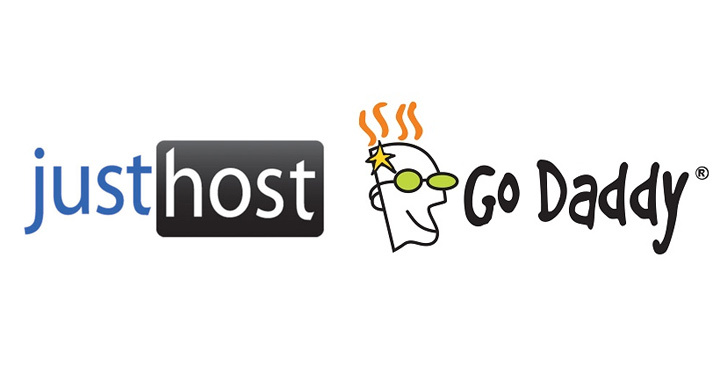 Both Just Host and GoDaddy offer site building software with hosting purchases. They also offer other software, such as WordPress, Drupal, and Joomla for free. Just Host offers Weebly site building software for free. GoDaddy offers GoCentral Website Builder and Microsoft Office 365 for monthly fees. Users can also publish websites using their own software. Both offer professional website building services for hire. Just Host makes it easy to see every possible feature they offer, but that can be overwhelming for a first-time user. The Just Host knowledge base primarily offers more technical questions and answers associated with experienced users. The organization of the GoDaddy site was more intuitive and easier to navigate. GoDaddy wins in this category for its features that are more enticing than the features that Just Host offers. Both services offer contact through email, chat, and phone, offering technical support 24 hours a day, 7 days a week. While conducting research for this article, the live chat feature was used for both. Just Host chat was not responsive, while GoDaddy’s live chat was quick and responsive. Just Host offers a free, template-based website builder for free, and feature a “1-Click Install” for WordPress. GoDaddy also offers a template-based website building application, but it is not free. WordPress and other software are free. GoDaddy wins in this category for its faster response time in these given conditions. Reviews incline to this fact as well. Just Host and GoDaddy are well matched. They performed well across all the criteria used in the comparison. However, GoDaddy is the winner, especially for first-time website builders. It has an easier and more intuitive site to navigate and easily found and accessible help. GoDaddy offers servers on both Linux and Windows platforms with well-appointed hardware for better website performance. If you still cannot decide for which one to opt, our GoDaddy vs SiteGround comparison might offer you some more insight, so check it out and let us know what your thoughts are.